It’s November! For most people it means getting out the Christmas decorations, planning road trips, and stuffing turkeys. For me it means I have to write. A LOT! November is the National Novel Writing Month, or NaNoWriMo. It’s a crazy challenge to write a 50,000 word (or longer) novel in 30 days. Crazy, I know. Last year when I reflected back on the challenge and how I beat it I realized that one of the most important things was to just commit to write daily. Each and every day I did something to work on my novel. Some days I only wrote 100 words, some days I wrote 10,000 words. Most days were in between. Focusing on the project daily is extremely important to completing this challenge because taking a break, even for a single day, makes it really easy to turn that into a two day break. Then three days. And before you know it months have gone by without writing. Getting into this daily habit also made the writing itself easier. This year is no different than last. It’s the daily commitment that gets me through the challenge. Writer’s block, being tired, all of those excuses get put aside because I have to get my word count in! I don’t have time for excuses. In the past couple of weeks since I started preparing for this crazy writing challenge I started to let things slip. I haven’t had time to get any articles out on ETM, for one. But also, I quit reading my Bible consistently. When taking on a huge challenge, whether it’s writing a novel, organizing an event, practicing for an upcoming competition, or just daily life with a full schedule, setting aside the Bible gets way too easy. We fall into the trap of thinking the Bible is just another motivational book, so it seems easy to let it fade into the background of life. But reading the Bible is a big deal. It’s the weapon we use in this battle taking place between our spirit and our flesh. The biggest battle you will face in life is your daily appointment with God. Keep it or every other battle will get bigger. Keeping ourselves focused on God and drawing close to him is a daily battle against our sinful nature. 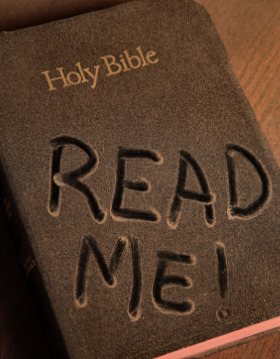 The more we read the Bible the closer we draw to God and the easier it is to walk by the spirit and not the flesh. I once read a book on fasting suggesting that weekly, or at least regular, fasting was important because it helped prepare the heart to hear from God. It wasn’t the act itself, because it isn’t the food we eat that gets in the way of listening to God. But the sacrifice of giving up food, something your body craves, to make God a priority, to focus that time on Him; that is what makes the difference. In the same way, sacrificing some time out of your busy day to focus on God does something to us. It isn’t simply the act of reading something, but it’s making a concerted effort to make God an important part of our day, and it helps prepare our heart to follow the Spirit instead of the flesh. Thankfully I have a godly wife that was there to help remind me of the importance of not sacrificing that time I should be spending with God. Walking in the flesh because we haven’t fed ourselves spiritually opens us up to a lot of temptation, hurt, and sin. It isn’t worth it. Especially for a husband who is trying to lead a house spiritually. It doesn’t take long for the enemy to come in and strike when we set down our weapon. A single decision made when we are following the flesh can have devastating consequences for a family. We are in a spiritual battle, and a single day of not being prepared can be lethal. I urge you, take a few minutes each day to read the Bible. It’s important. Very important. It doesn’t have to be a lot. Just reading one chapter, or even finding a single verse to meditate on throughout the day. Anything to feed your spirit and help you to win those battles against the flesh.